Pallet Flow – Canadian Rack Inc.
Pallet Flow Pallet Racking Systems, also known as gravity flow rack, are designed to utilize the natural force of gravity to move the pallet load into picking position, so it can be accessed by the forklift operator. Pallets are loaded from one side of the pallet rack and retrieved from the other. Once loaded, the pallet flows downward, without much effort, to the unloading end. From there the forklift operator can easily take the pallet to the desired location. 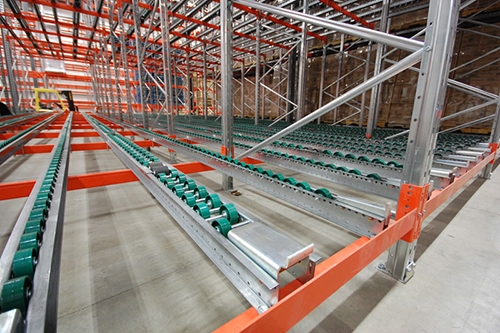 Because pallets are loaded from the back end and unloaded from the front, it allows racking to be filled with pallets with fewer aisles needed.